Watch designers find inspiration in a great many things: automobiles, aircraft instruments, even espresso machines. 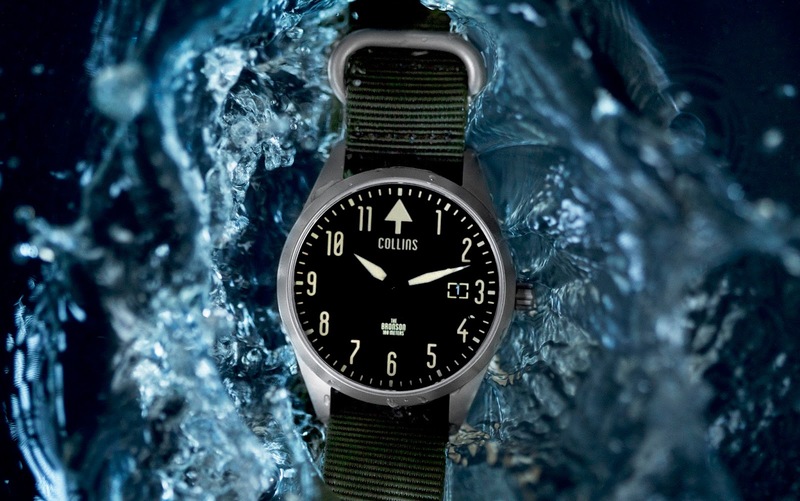 When Jimmy Collins decided to design a watch, he found his muse in the recording studio he had recently built in Los Angeles. 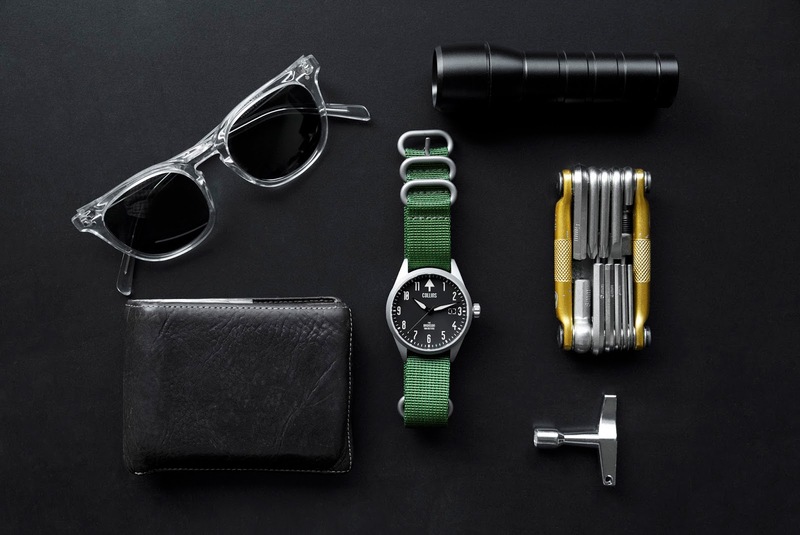 That watch, The Bronson will be released on Kickstarter today. I have yet to lay my hands on one, but I like what I've seen so far. 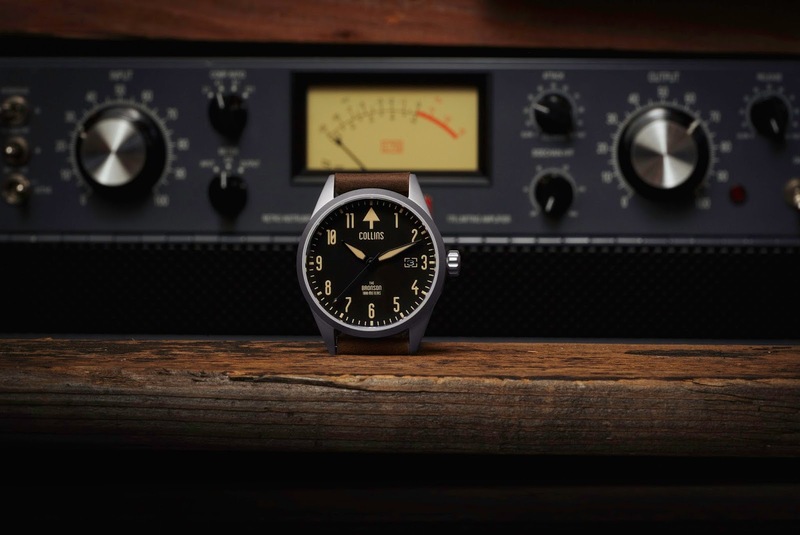 Audio equipment has its own particular aesthetic that places a high value on legibility and functionality, both of which should translate well to a timepiece. The Bronson is essentially a Nav-A type flieger layout with Arabic numbers and dagger-like lozenge hands, but its style diverges from there. The navigation triangle at 12 o'clock is more of a pronounced arrowhead. The numbers are rendered in an appealingly retro typeface that is tall and slender with slashed zeros. The second hand looks like the needle on a volume unit indicator. The final audiophile touch is a volume knob crown. 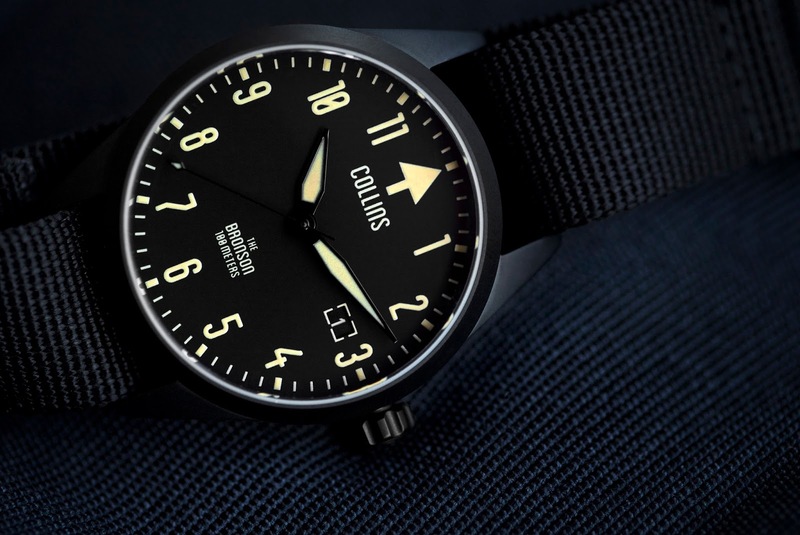 Collins has placed several lines of text on the dial, printed in the same typeface as the numbers. A white-on-black date disc is neatly incorporated into a bracketed window at 3 o'clock, neither crowding nor displacing anything else on the dial. It is all neatly proportioned. My only criticism is that the "The" placed over the model name looks lonely all by itself. I would have preferred if it was left off entirely, but that is a minor quibble. The dial is only available in black with creamy Old Radium SuperLuminova, which is an appealing combination. I fear the black second hand with its tiny lumed tip may be difficult to read, but I will reserve judgment until I see one in person. 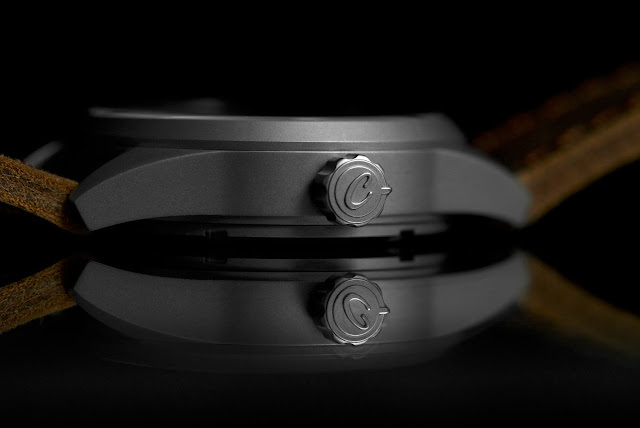 The case is 40mm wide, 48mm long, and 12mm thick with an AR-coated sapphire crystal and either a bead blasted matte silver or PVD black finish. 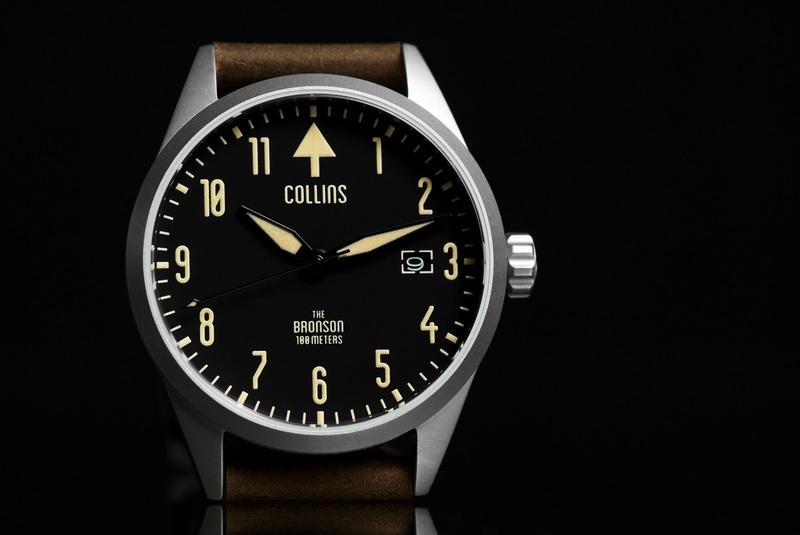 Silver watches have solid case backs engraved with the Collins logo, although it is different from that on the dial. Black models get a display window. The Bronson is rated for 100m water resistance. Inside, you will find a workhorse Seiko NH35A automatic movement. All the parts are produced overseas; final assembly and testing is done in the US. 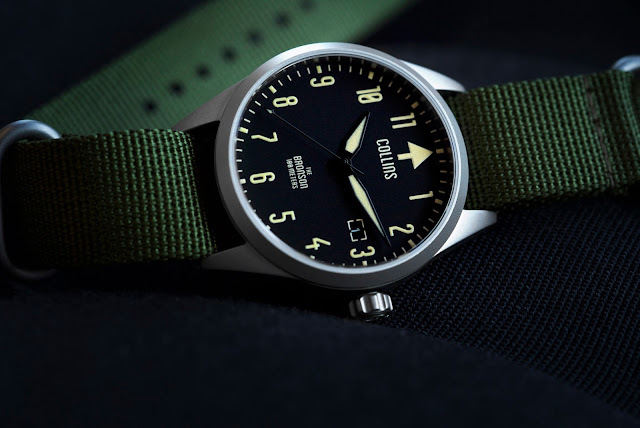 The watch will come on the buyer's choice of 20mm strap: military nylon Zulu, or distressed leather. Both options will have hardware that matches the case. For an extra $25, you can have both. 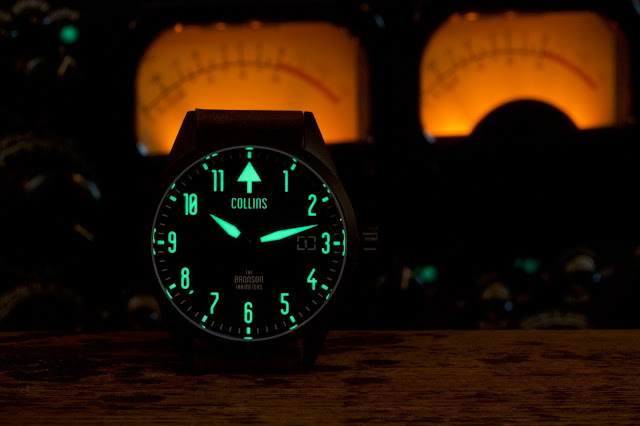 Overall, the Collins has a fairly subtle design theme, and that is good. Nothing about The Bronson screams "music." Instead, the sound gear inspiration merely offers just enough of a distinctive touch to set the watch apart from the rest of the flieger and field watch crowd. All photos courtesy of Collins.